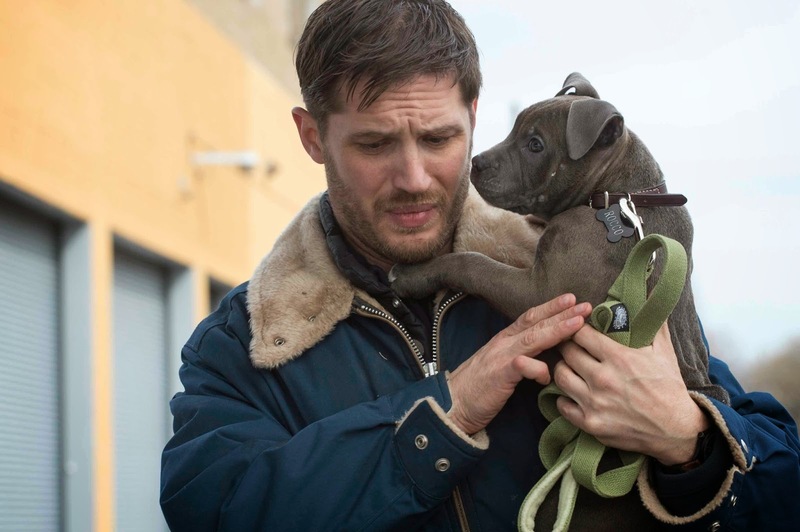 Tom Hardy heads up a phenomenal cast in this gripping tale of crime and passion in “The Drop” from a screenplay of world-renowned crime novelist Dennis Lehane. At first glance nothing looks particularly unusual as the movie starts. But as the clientele of the bar put their hands on their hearts, Bob (Hardy) discreetly stashes an envelope of cash behind the bar. Indeed, there's more to Cousin Marv's bar than meets the eye. Cousin Marv (played by the late James Gandolfini) has been drawn into working with a group of nefarious Chechen gangsters, meaning his employee Bob has to go along with the scheme. Meanwhile, the bartender has found an abandoned pit bull puppy in a trash can, leading him to cross paths with the beautiful but troubled Nadia (Noomi Rapace) and her violent ex-boyfriend Eric (Matthias Schoenaerts). It's the set-up for an explosive, emotional drama with plenty of twists and turns. Bob’s simple life becomes much more complicated when he discovers a battered pit bull puppy in a trash can. Turning to his neighbor Nadia (Noomi Rapace) for help, he nurses the puppy back to health, as their mutual concern for the dog sparks an unexpected attraction between them. But when Eric Deeds (Matthias Schoenaerts), the dog’s original owner and Nadia’s abusive ex-boyfriend, tries to reclaim both of them, and a robbery at the bar puts Bob in the crosshairs of the Chechen crime boss who owns it, Bob is forced to face the shocking truth about the people he thinks he knows best—including himself. "This has been an intense shoot," says director Michael Roskam. "It is such a tense story, but there is also a huge amount of heart. That combination is really what made me fall in love with it." The cast and crew know that they are making something special. "It's a very beautiful story about daring to take a risk with your emotions," muses Rapace. "To let someone in, even though you have a smashed heart. Someone who has been beaten up really badly still finds a way to believe and to hope again. Through a dog!"